Oil on panel - 8" x 14"
How's that for a title? I did this piece a while ago as a study for a larger painting in a series of long postponed fetish works. I may be revisiting the concept. I'm off to Alabama (no banjo on my knee) in the morning to see my dear Uncle Bob in hospital. New work on Monday... Promise. Oil on museum quality archival 1/8" ampersand gessobord panel - 6" x 6"
I hesitated to post this painting tonight because I wasn't happy with it. I was pressed for time and I thought “Hey, I’ll just knock out a simple shell.” Boy. was I wrong. I have new respect for my fellow painters who do this well. I’m shocked, shocked to find out just how difficult the convincing depiction of a shell really is. The reflections are soft and must be handled very gently and the rainbow of iridescent color changes are mind boggling. To quote Scarlett O’Hara; "I can't think about that right now. If I do, I'll go crazy. I'll think about that tomorrow." "Look, what envious streaks do lace the severed clouds in yonder east. Nights candles are burnt out, and yocund day stands tiptoe on the misty mountain tops." 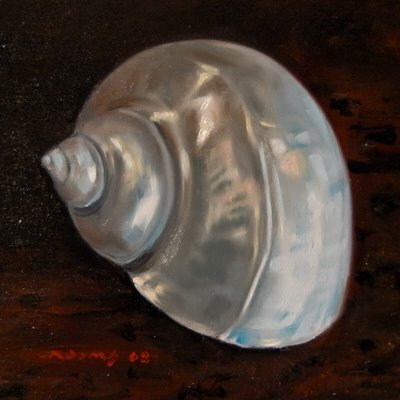 It is tomorrow and the soft light of dawn is flowing into the studio and playing off the prism of color on the shell...and to think, I almost lost this to the rag. A lesson from Treebeard: Don't be hasty! 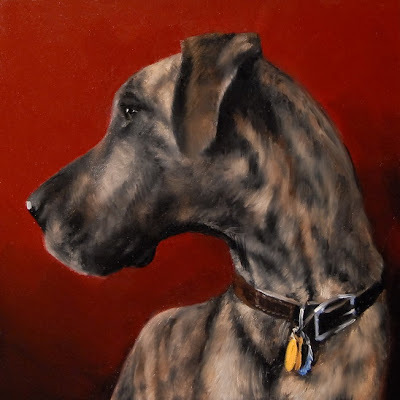 Oil on archival, museum quality 1/8" ampersand gessobord panel - 6" x 6"
Painting a brindle Great Dane was a new experience for me. The brindle coat presented quite a challenge. There are very dark hairs and very light hairs playing off each other. If you lay down the blacks and then feather in the pale Naples yellow, they want to blend together. It takes a soft touch to get the effect. Mr. Big is one gorgeous Dane. His coat is almost tiger striped with rich umbers and deep blacks shot with pale yellow highlights and they don’t come any sweeter. He shares his digs in Baltimore with Walter the wonder wiener. They make quite a pair. I've always had a soft spot in my heart for Danes. One of my very first commissions was a painting of a harlequin Great Dane, way back in the early seventies. My cats were not happy with his modeling sessions at the studio. That early commission was almost life size. Is it me, or is it perverse to paint a Great Dane on a 6 inch square panel? I have spoken of my dear Uncle Bob in previous blog entries. 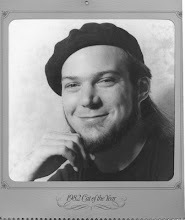 Mentor, friend, patron, it was he who long ago bestowed upon me my first beret. I have worn one since I was 16. Coming to grips with looking like a cliché in my teens was tough, but my friends soon got used to it. When Bob comes to Baltimore for a visit, he, too, is wont to wear one, which makes for some sniggering and tittering among the people. For my 50th birthday, my wife bought a gross of black berets and gave them out to my friends. Seeing 80 plus people dressed in black turtle necks and berets was something else. It looked like a giant poetry slam from the 50’s or a Maynard G. Krebs convention. Very cool, daddy-o. Uncle Bob is fighting the big C, and I am having a hard time concentrating on painting. I thought I would post a little panel I did of him back in ’93. It captures the essence of the man. You have to picture in your mind the 16-ounce Bud in his hand. 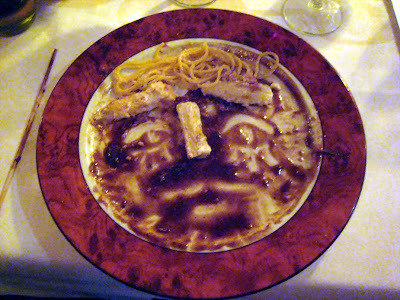 "Chicken Marsala and chocolate cheesecake"
I couldn’t get into the studio today but I was able to channel some creative efforts at a long postponed birthday dinner in my honor. Thanks D & F (and M). 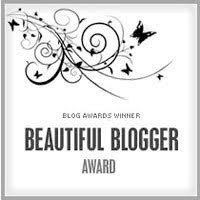 It was a truly memorable evening! I hope Walter has slept it off. 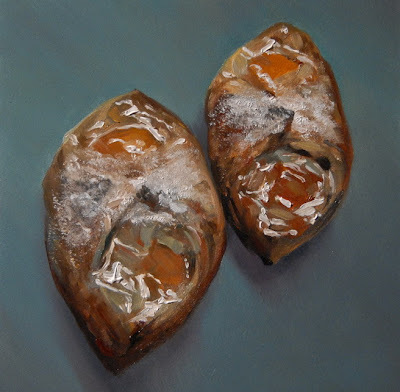 Oil on panel - 6" x 6"
The Baltimore Ravens aren’t the only ones guilty of turnovers. As many of my fellow painters have noted – everyday brings a new painting experience, some good, some not so good. Taking these pastries out of context and setting them on a neutral space, without a point of reference was not a good idea. 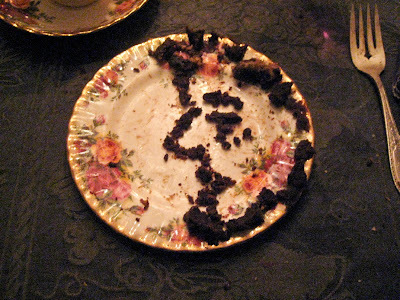 I thought the glistening jelly and powdered sugar would carry the painting, but it was not so. I had the rag in my hand ready to wipe it down when my wife talked me down from the ledge and convinced me to post it anyway to show both sides of the creative process. Even a French title won’t help this one. Oil on archival, museum quality 1/8" gessobord panel - 5" x 7"
I don’t know whether I am feeling particularly patriotic today or if I am caught up in the red state / blue state political rivalries that are dividing our country, but the red, white and blue palette of this piece can’t be denied. Since I am an independent, moderate, it is a good thing that purple is my favorite color. Certainly 2008 is going to be an interesting year that may require more than one of these martinis before it’s over. I am a scotch man myself although I wouldn’t turn down a good dry martini. "Here's looking at you, kid." 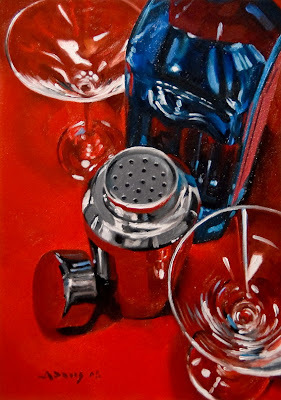 I was hesitant to try this composition on a bright red tablecloth as I thought that the subtleties of the pale aqua tones of the gin would be lost. To my surprise, the bottle took on a deep cobalt/ultramarine hue. Painting the Harley last week only whetted my appetite for more chrome, so the cocktail shaker was a good fit. My biker brothers say “chrome won’t get you home” but I am a sucker for the stuff. Now where did I put my shades? 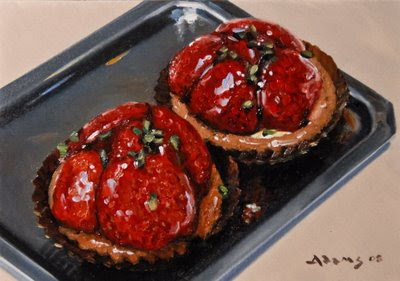 "Tartelette de fraise avec des pistaches"
oil on archival, museum quality 1/8" ampersand gessobord panel - 5" x 7"
What can I say about strawberries? When I was a boy, my dad took me sailing every Sunday, whether I wanted to go or not (I didn’t). He longed for me to share his passion for being “in the wind;" I never did, although being “in the wind" on a motorcycle has been my passion for 40 years. When I was old enough to drink, preferably beer, sailing became way more tolerable. Dad kept a bottle of Chivas Regal on the boat which, I later found out, contained Four Roses that he had decanted into the empty Chivas bottle after he had finished it. That was my Dad. On the high seas, you drink what’s available...any port (or scotch) in the storm. For years I thought Chivas was swill until he sheepishly confessed. Dad, an old navy man, was ahead of his time. Long before the gas wars of the 70’s, when the price of gas on the dock skyrocketed, propelling all those Chris-craft owners to take up the sheets, Dad had his little wooden Spanish sailboat; the Señorita, moored at Stacy’s Salvage Yard. It was the only sailboat in the place. Later Stacy’s would grow to become the Trade Winds Marina, a huge sailboat facility, but back then it was little more than a marine junkyard. The bright spot of going sailing on Sundays was the prospect of getting a 25 cent hamburger at Gino’s or, in season, going to the farm near the boatyard and picking strawberries. There was a “pick your own” field on the road near the docks and this was my introduction to real fresh produce. The prospect of fresh strawberries and corn on the cob in late summer made those Sunday sails bearable. I grew up, as did most of us in the 50’s, with canned vegetables. I didn’t see fresh spinach, peas, asparagus or mushrooms (which I never saw, period) until I left home. I can tell you canned asparagus is nasty and don’t get me started on succotash. Who came up with that one? Why ruin perfectly good corn, even canned corn, by adding lima beans…yuck! Those ripe fresh berries made for some tasty strawberry shortcake! 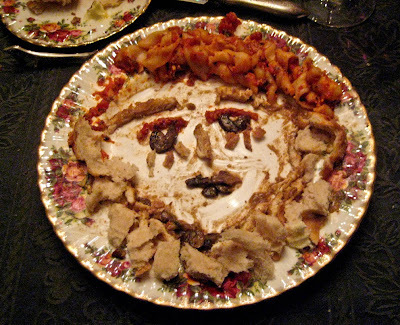 I owe my artistic voyage to my mother’s side of the family. My mother, a tall, slender, attractive woman was, in her youth, a runway model and actress. Of her two brothers one was a fashion and costume designer who later went on to become one of the most celebrated operatic directors of our time. The other earned a PhD in German literature, was an orchestral conductor, Gilbert and Sullivan scholar, gourmet cook and was also well versed in the visual arts. With all this creative influence, is it any wonder that my father, an electrician, feared for my future? Did I mention that one of my uncles was gay? OMG! Some of his fears were assuaged when I got married and fathered a child at the tender age of twenty one, but that’s another story. Suffice it to say that my mother's side of the family won out as far as my becoming an artist and not an electrician. In truth, now that I am a home owner, I wish that I had paid more attention to Dad growing up. I could have learned much on those days that I accompanied him on electrical jobs. He knew that I would never starve (or still be living at home at 30) with such a skill. We lost Mom in 1985 and I always think of the “Blondie” song – “Die young, stay pretty.” Uncle John recently succumbed to cancer and he, too, is gone. I went to visit my Uncle Bob in Birmingham, Alabama this past weekend. No small amount of my early creative efforts resides there with him. I was struck with just how many “daily paintings” I had done in my youth. There were peppers and onions and crawfish and crabs and loaves of bread and oysters. Yes, even in my early twenties the lowly bi-valve held an irresistible fascination. I can thank Dad for introducing me to them many years ago by taking me to bull and oyster roasts at the American Legion. This painting is one I did back in 1976 at the age of 23. Look for new work tomorrow. "All things change according to the state we are in. Nothing is fixed. I lived once in the top of a house, in a little room, in Paris. I was a student. My place was a romance. It was a mansard room and it had a small square window that looked out over housetops, pink chimney pots. I could see l’Institut, the Pantheon and the Tour Saint James. The tiles on the floor were red and some of them were broken and out of place. There was a little stove, a wash basin, a pitcher, piles of my studies. Some hung on the wall, others accumulated dust on their backs. My bed was a cot. It was a wonderful place. I cooked two meals and ate dinner outside. I used to keep the camembert out of the window on the mansard roof between meals, and I made fine coffee, and made eggs and macaroni. I studied and thought, made compositions, wrote letters home full of hope of some day being an artist. It was wonderful. But days came when hopes looked black and my art student’s paradise was turned into a dirty little room with broken tile, ashes fell from the stove, it was all hopelessly poor, I was tired of camembert and eggs and macaroni, and there wasn’t a shade of significance in those delicate little chimney pots, or the Pantheon, the Institute, or even the Tour Saint James." This I read, lo these many years ago, when I was starting out on my own artistic journey. I was given a copy of The Art Spirit by Dr. F. Robert Lehmeyer, my Uncle and mentor and I, in turn, bestowed a copy on many a young aspiring artist. 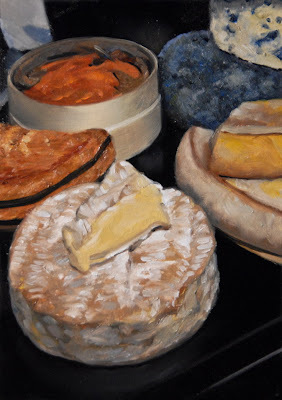 I can’t look at a wedge of camembert without thinking of this story and my early days as an artist. Blessed are the cheese makers. 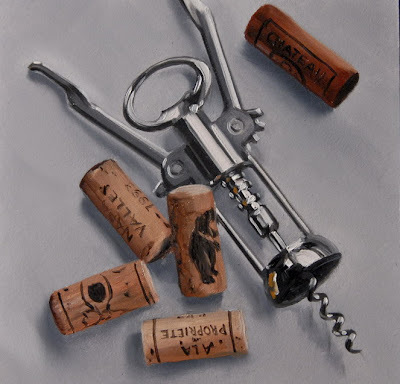 Oil on archival museum quality 1/8" gessobord panel - 5" x 5"
This is the companion piece to the painting (Haut Medoc-1997) that I did in December. The ubiquitous Mark Spitz corkscrew has been around for quite a while. We all have one tucked away in a draw somewhere. Though not my favorite device for the extraction of a cork from a lovely bottle of Bordeaux, it is always there as a reliable backup when the Cépage Laguiole corkscrew goes missing, as it is wont to do, buried under the myriad of saved corks in the drawer where it resides. Why Mark Spitz you ask? Those of us old enough to remember Mark Spitz capturing a record seven gold medals at the 1972 Olympics also remember just before we opened that bottle of Mateus Rosé or Lancers, we would hold the chrome corkscrew horizontally, pull in and out on the screw end, the levers swimming wildly through the air and ask with a giddy laugh “Hey guys, who’s this?" ...I guess you had to be there. Oil on achieval, museum quality 1/8" panel - 6" x 6"
In the words of Monty Python: “And now for something completely different!”- I give you the "Harley-Davidson Softail." What many of you may not know is that I am an avid motorcyclist. I started out on a Yamaha RD80 when I was 14, hill climbing in the field behind my house, then on the street with an RD250, Honda CB360 and Suzuki GS850. A vintage Vespa was my sole form of transportation during my "starving artist" period, and the fascination with scooters has lasted up to the present. I recently got rid of my totally restored 1966 SS180 and am trying to make room in the garage for a pair of GTS 250s. I got bitten by the Harley-Davidson bug back in 95 and my poor wife has been a Harley widow ever since. There are few things more beautiful than the classic lines of a Harley. If I could keep my bike inside my studio, I would. My computer name has been Hogadams for years. I went to the Mid-Atlantic Motorcycle Show this past weekend and the place was teeming with a dazzling array of chrome and steel. From old classic scoots to high dollar customs there was much to see and photograph. 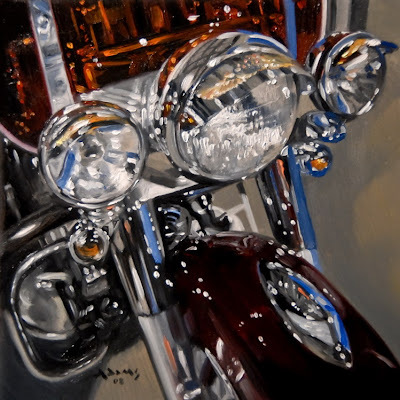 Painting the reflections through the red windshield of this Softail was fun, as was the sparkling highlights of a thousand lights bouncing off the highly polished chrome and deep black cherry paint. As I type this it is 21° outside. Even riding a dresser with electric handgrips and an electric vest, I am afraid Betty (my Ultra) will have to be content with my visits to the garage to stare at her beauty and polish her chrome. I hate Februarys...sigh. 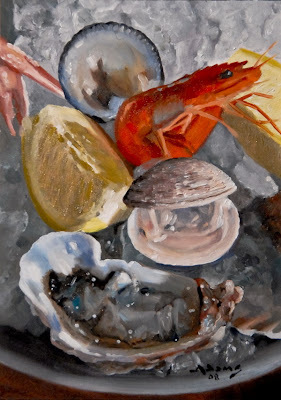 "Plateau de fruits de mer"
Oli on panel 5" x 7"
Do you honestly think that I could go to Paris and not avail myself of the local seafood? 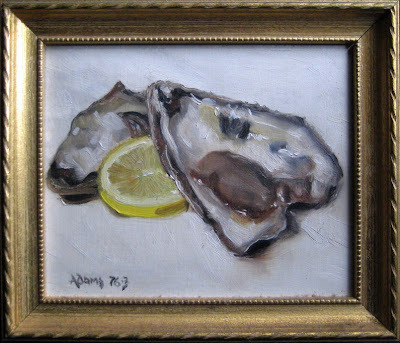 Many of the brasseries had fantastic displays of freshly shucked oysters; clams known as amandes; raw mussels; baby shrimp in their shells; cadmium red prawns; whole cooked crab; chewy sea snails known as bulots and tiny blue-black winckles. We succumbed to their sirens song and soon found ourselves starring at a beautiful Plateau de fruits de mer; a gorgeous, glistening assortment of shellfish, or fruits of the sea perched high on the table on an ice-filled round metal platter. Accompanied with slices of rye bread, lovely French salted butter, quarters of fresh lemon, mayonnaise and mignonette, my companions could only drool and eat bread, as I spent 10 minutes capturing it from every angle with my camera. My wife is used to me discreetly photographing food at restaurants. We can’t eat steamed crabs (a Baltimore specialty) without me whipping out my faithful little canon elph. “Can I eat now?” is her common mantra. It has gotten worse since the daily painting started as everything is possible creative fodder. Trying to keep it fresh (no pun intended), I may leave Paris tomorrow and try something a little different. Stay tuned. Since I didn’t finish yesterday's painting for various reasons and excuses (and I know all of them), I thought I would show you how to elevate these little panels to small wonders. My last day job was back in 1974. I worked at the venerable Purnell Art Company as a framing craftsman and restorer. I have a lot of respect for the art of framing and it is an art. The reason we frame 2-dimensional works of art is because without containing the image, the lines and colors would visually drift off into space. Perhaps lattice strips would suffice, but a well made frame that complements the work adds to the charm and grace of the artwork. A case it point: The Baltimore Museum of Art is home to the Cone Collection, works by Picasso, Braque and that early 20th century gang of modern masters. The paintings were framed in the big Victorian frames popular in the day. When a new director of the BMA came onboard, she thought it would be a good idea to take off the grand Victorian frames put on by Gertrude Stein and the Cone sisters and put them into something that she thought would have pleased the modern artist’s sensibilities – little gold stripping. It was awful!! The hue and cry that followed the unveiling of the collection can still be heard. Thankfully, cooler heads prevailed. The old frames, mercifully, carefully retained, were restored and the director has moved on to ruin things elsewhere. I myself am a proclaimed frame fetishist and tend to over frame the work I live with. It is not uncommon for me to spend many times the value of the art on a great frame. Here in Baltimore we have the Fleckenstein Gallery. Terry really knows her stuff and offers some drop-dead gorgeous molding. 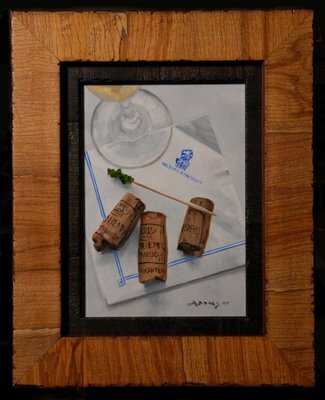 Today’s painting which I posted in December demonstrates just how much a frame works to enhance a painting. The frame you see has a depth of an inch and a half with beautiful mahogany sides. Go ahead; spend the money on a good frame. You will thank me. 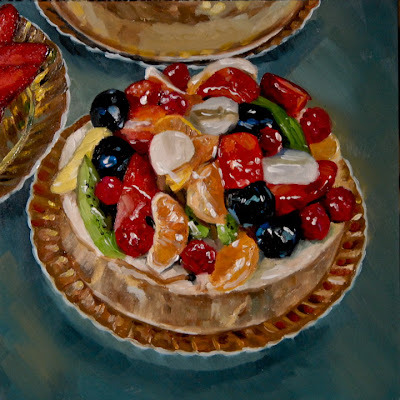 "Gâteau au fromage avec le fruit glacé"
When I choose to paint this piece, I thought it would be a walk in the park. Little did I realize that the myriad of hues in all that fruit would translate to way more time than I would have imagined analyzing and mixing colors? I wanted it to be free and glistening and that it is. The cheesecake is held in place with a clear collar which reflected nicely the gold fluted plate. When I am finished with this Paris series, you will be well on your way to learning the French language. Pay attention – there will be a quiz. Répetez après moi - fermez la fenêtre. 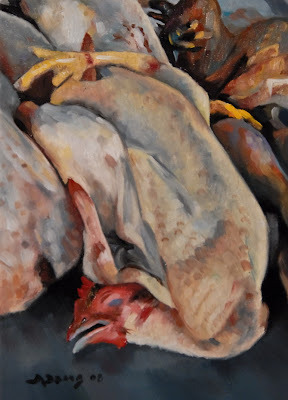 "Poulets au marché de fermiers"
Although I fancy myself both a gourmet and gourmand, I have my head in the sand when it comes to the realities of food and death. Here in the states, our meat is cut into nice little pieces and hermetically sealed in cling wrap. At the farmers market in Paris, here were the chickens – head, feet and all. I don’t know why, but I kept thinking about Chicken Little when I came upon these little guys and felt sad for them. If I had to kill my own food, I probably would be a vegetarian. All that said, the almost abstract quality of the varying colors of the flesh made for an interesting painting exercise and I sort of like the pathos. I came home with a nasty, imported French cold and could use some chicken soup right now…sorry guys. If the French are so mean and unfriendly, why is it that they have so many carousels all over the place? The landscape is littered with them. That seems to be somewhat of an incongruity. Perhaps they are really a fun loving people after all. Well and why not? 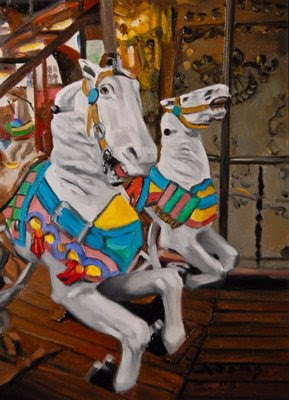 After all, it was the French that invented the carousel in the 17th century to celebrate the equestrian festival of Louis XIV. I was fascinated with the artistry of the carvings and their bold colors. This one was in Montmartre. The general consensus in our country is that the French don’t smile. The truth is that the French just need a reason to smile. 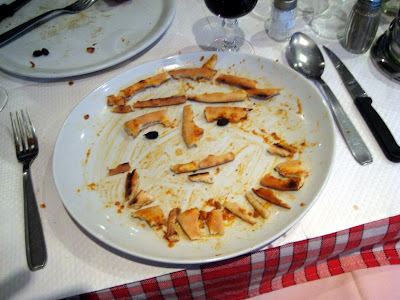 I am here to tell you that I brought out a smile wherever I ate. Perhaps it was visiting the Picasso museum that inspired me to create these impromptu portraits, or perhaps it was not being near my studio for a week. If ever you visit France, first read Polly Platt’s book, “French or Foe.” It explains in clear terms the differences in our cultures and how to get along. I found the people extremely warm and friendly. One example: as we stood on the platform trying to figure out which train we needed to take to Versailles, a Frenchman nearby came over to help us even though his train had just pulled in and he had to run to just catch it before it left. On another occasion we visited a farmers market and went into sensory overload at the sights and smells of stall after stall of lovely meats, fresh flowers, and beautiful produce. I guess the locals take the food home to eat later, but we couldn’t stop ourselves from buying grilled sausages, crusty cheese bread and warm boiled potatoes and eating them on the spot. 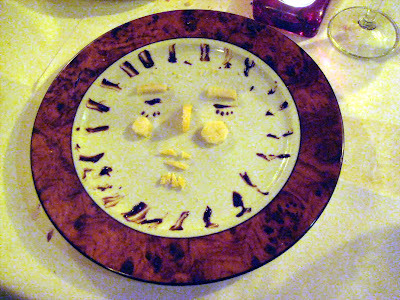 One woman was plainly amused at this and with a big smile said “Bon appetit!” as she passed by. Even though I had a few disappointments such as the Dutch and late 19th century French wings of the Louvre being closed and Courbet’s paintings being elsewhere as the Musée d'Orsay redid their room, I had a really great time and the next few weeks will be filled with images that inspired me.